Rdocumentation.org is the only R documentation and R manuals aggregator that lets you search everything from CRAN, Bioconductor and GitHub. Especially for useR! 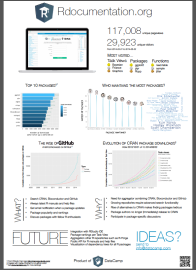 2014 we created a poster on Rdocumentation.org, our R documentation aggregator that lets you search R documentation and R manuals from CRAN, Bioconductor and GitHub. We received a lot of positive and valuable feedback on it, so we decided to share it again via our blog. What are the 10 most downloaded R packages of all time? Who maintains the most packages? What are the most popular task views, and how did this ranking change over time? How popular is GitHub in the R community? So if you did not make it to the useR! 2014 conference, or in case you could not attend the Wednesday evening poster session, you hereby have another chance to have a detailed look at the poster. Feedback and questions can be sent to team@datacamp.com. Feel free to share it with your network! On Rdocumentation.org: Rdocumentation is a web application that helps you to easily find and browse the documentation of R documentation and R manuals on CRAN, Bioconductor and GitHub. It enables you to instantly search for functions and use advanced search on the documentation of all R packages.